Michaela Grant travels to Scotland for a holiday, knowing this vacation is her last. A medical condition threatens her life and any chance of a future--until she meets Alan MacLachlin, a man forced to exist between two worlds. Alan is the legendary Loch Ness Monster. Once every fifty years he returns to human form in search of his soul mate, the one woman who can break his curse. He believes he has found forever with Michaela, but to claim it he must figure out how to save her life. Michaela and Alan vow to take what time has to offer, but another threat looms. 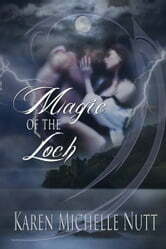 A sinister shape shifter with a vendetta against Alan is making Loch Ness his personal hunting ground. Now he's threatening Michaela. Alan must discover who the shifter is and stop him before it's too late.